The Feast of Winter Veil begins tomorrow! While enjoying a freshly nutmegged cup of nog, and crunching on a crumbly cookie or two, be sure to visit Greatfather Winter in Ironforge if you’re Alliance, or Great-father Winter in Orgrimmar if you’re Horde. While there, you’ll find a few treats, and surely a few tasks to take on as well. 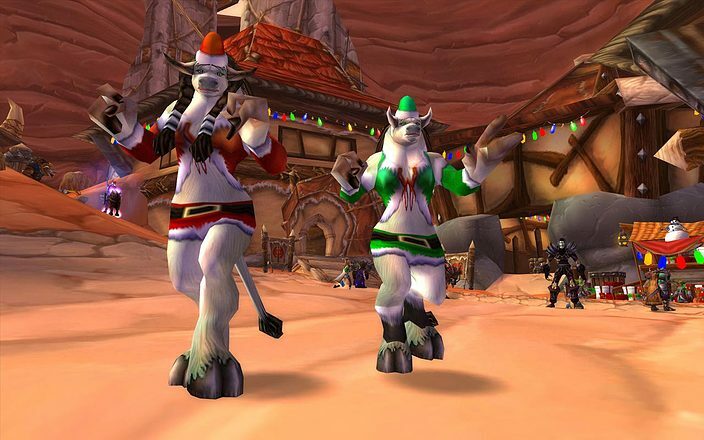 Winter Veil isn’t just popular among the citizenry—dungeon denizens throughout the world are also getting into the holiday spirit. Some dungeon bosses wear festive Winter Hats just like Greatfather Winter'—defeat a Winter Veil boss, and the boss' hat is yours! Greatfather Winter is visiting the great cities of Ironforge and Orgrimmar—courtesy of the fine folks of Smokywood Pastures—and he's spreading cheer in celebration of the Feast of Winter Veil. But, all the cheer—spreading is making Greatfather Winter hungry, and he's looking for helpful adventurers to fetch him some milk and cookies. Smokywood Pastures goblins have set up strange PX-238 Winter Wondervolt machines which can be used to change your character into a festive Little Helper! The buff lasts for 30 minutes but is removed by shapeshifting or death. Will you be red or green? It’s a surprise! You can refresh the duration of the buff at any time by stepping into the Wondervolt machine. During the Feast of Winter Veil, innkeepers bring out holiday decorations to provide a festive atmosphere for their patrons. Who knows what might happen if you /kiss a reveler standing near a sprig of mistletoe. . .
Smokywood Pastures needs a few brave adventurers to investigate the disappearance of a shipment of holiday goods. Rumors abound that the shipment has been snatched by The Abominable Greench, located somewhere in the snowy Alterac Mountains. Disaster has struck! Metzen the Reindeer—one of Greatfather Winter's eight reindeer (and the property of Smokywood Pastures) has been kidnapped! The Jinglepocket Goblins in Ironforge and Orgrimmar have received two ransom letters from groups claiming to have Metzen, so concerned adventurers should visit them for more information. The Jinglepocket Goblins have set up their seasonal shops in major cities. Inside, you can purchase many holiday favorites—including Greatfather's Winter Ale, candy canes, gingerbread cookie recipes, and mistletoe. Historically, Greatfather Winter has always been accompanied in his journeys across Azeroth by his loyal snowmen. They can be found wandering around Ironforge and Orgrimmar, bringing the chill breath of winter into even the warmest climes. In the quiet, early hours of the day on the 25th of December, the industrious goblins of Smokywood Pastures are already awake and busy. These generous harbingers of the holidays deposit gifts underneath the festively decorated trees in Orgrimmar and Ironforge as a much-deserved reward for the noble adventurers of Azeroth. Keep a keen eye out for these presents, as they're there for the taking! These professional hoarders will sell you food, recipes, snowballs and more! This robot may be found in a Stolen Present. It might be a bit aggressive towards other robots. This tiny reindeer may be found in a Gaily Wrapped Present under Winter’s Veil tree. This companion will bring winter’s merriness with you at any time of year! The snowman won’t follow you around, but will respond to certain emotes when targeted. These companions require one snowball to be summoned. They are taught by Red and Green Helper Boxes respectively, and found inside a Gaily Wrapped present. These beautiful hats come in green and red, and can be looted from some bosses during Winter Veil. Gift boxes of varying shapes and sizes can hold all manner of toys and treasures, including a Toy Set Train, Wind-Up Train Wrecker, Clockwork Rocket Bot, Paper Zeppelin Kit, Mechanical Greench, and more, all the way on down to the venerable Lump of Coal. This single-use item will give you a 1-hour buff that transforms your mount into a Reindeer whenever you mount up. Be careful not to have a passenger with you if you are on a multi-passenger mount! This single-use item will transform your mount into a Reindeer until you dismount. Much like with the Preserved Holly, your passengers will be out of luck. Whether you pick them up in the wild, buy them from a local vendor, or ask a friendly engineer to craft them for you, no Feast of Winter Veil is complete without some frozen projectiles. 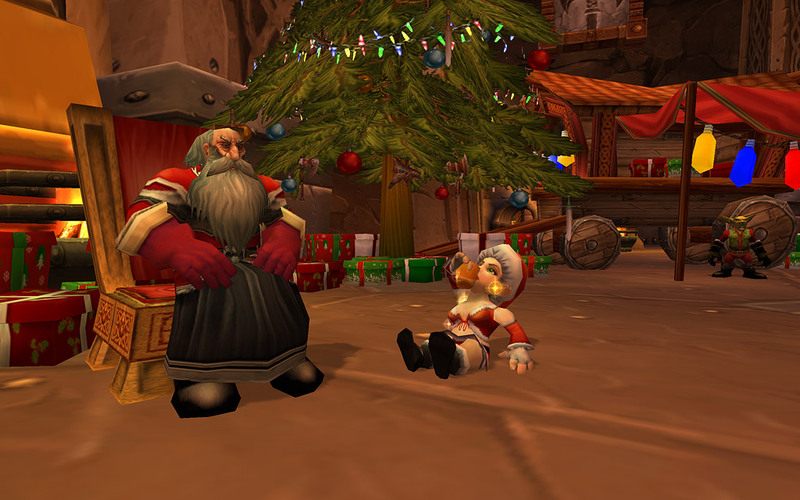 Get your mitts on some Snowballs and say, "Merry Feast of Winter Veil" the old-fashioned way! It is time to wrap things up to offer presents to your friends! This festive paper is available in blue, green, and purple, and can be purchased from merchants for a measly two coppers. This single-use item showers a nearby target with a cascade of snowflakes. You’ll receive it when you /kiss a Winter Reveler under mistletoe. Many delicious meals, beverages and sweets can give you a buff and help your character recover health and mana. They’re also simply delicious! 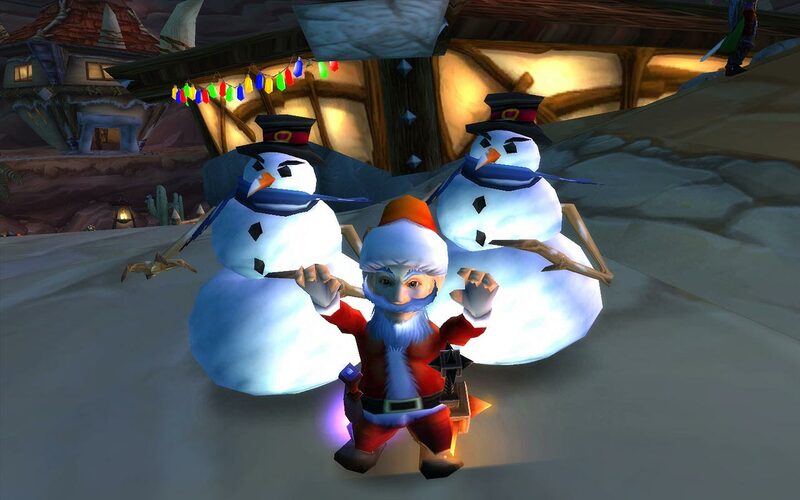 During the Feast of Winter Veil, you’ll be able to buy or create the following foods and drinks: Honeyed Holiday Ham, Winter Veil Roast, Spicy Beefstick, Graccu's Homemade Meat Pie, Holiday Cheesewheel, Gingerbread Cookie, Candy Cane, Winter Veil Eggnog, Sparkling Apple Cider, Greatfather's Winter Ale, Green Garden Tea, Blended Bean Brew, Steamwheedle Fizzy Spirits, Holiday Spirits, and more. Toss these classic toys to other players in your faction, and they’ll send them bouncing or spiralling right back to you as long as they’re able. Pass up a flurry! The Feast of Winter Veil currently offers a total of 150 achievement points, split over 14 achievements and 1 meta-achievement. Please note that all objectives for Achievements between the Horde and Alliance are relatively the same, though there are some minor differences. If you complete eleven specific Achievements (On Metzen!, Scrooge, 'Tis the Season, Let It Snow, The Winter Veil Gourmet, A Frosty Shake, With a Little Helper from My Friends, Fa-la-la-la-Ogri'la, Simply Abominable, Bros. Before Ho Ho Ho's, He Knows If You've Been Naughty, Gains), your character will gain the Merrymaker title. Check out our Winter's Veil screenshot gallery!